Imagine not being able to communicate with other persons, whenever power goes off…? 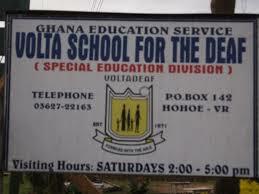 This is the situation, in which students of the Volta school for the deaf in Hohoe found themselves, due to their hearing and speech impairment. Because of the current power crisis, the students who communicate through sign language, can no longer interact in the evenings during power outages, as they unable to see and interpret their own ‘signings’ [gestures] in darkness. The situation has therefore left with no option than to retire to early bed, since the school also lack a standby generator to remedy the situation. Headmistress of the school, Madam Diddy Ntim told Volta Online in an interview that, the erratic power situation is adversely affecting school activities in the evenings and appealed to benevolent individuals and organizations to come to their aid. The school founded in 1971 and solely funded by the government of Ghana, currently has a population of about 400 students. Madam Ntim, has therefore asked for public support in terms of food items and sponsorships to complement government’s efforts in educating these children with special needs.